Big and beautiful…. the quilt, not me, you silly. 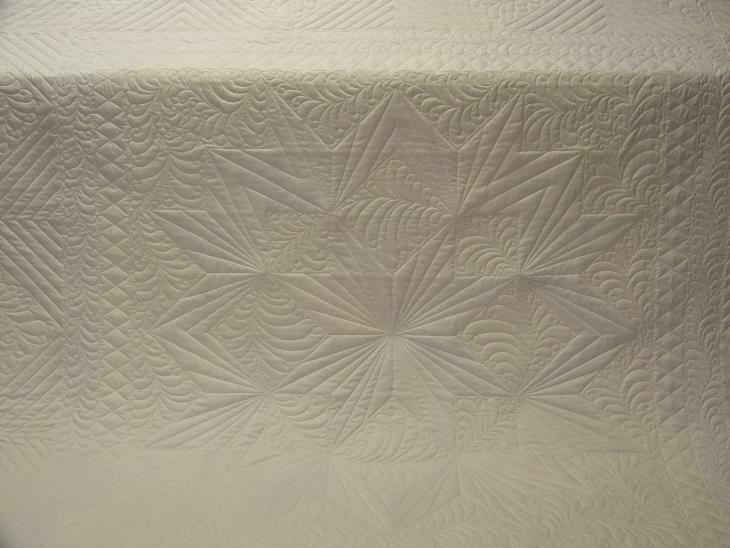 I have not been able to quilt as much as I normally do because I have been pretty sick. 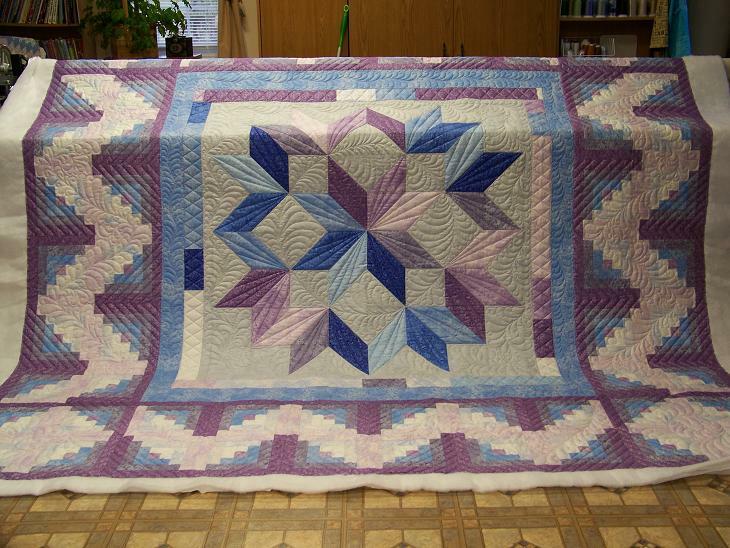 But little by little, I finally got this quilt done. It was on my machine for 18 days. Normally, I would have been able to do this one in 4 days. Thankfully, my friend Sammi has been patient about waiting for me to finish. So Fine thread in bobbin, White Glide on top. Quilter’s Dream Puff batting. and got LOTS of wonderful suggestions. Thank you all so very much. 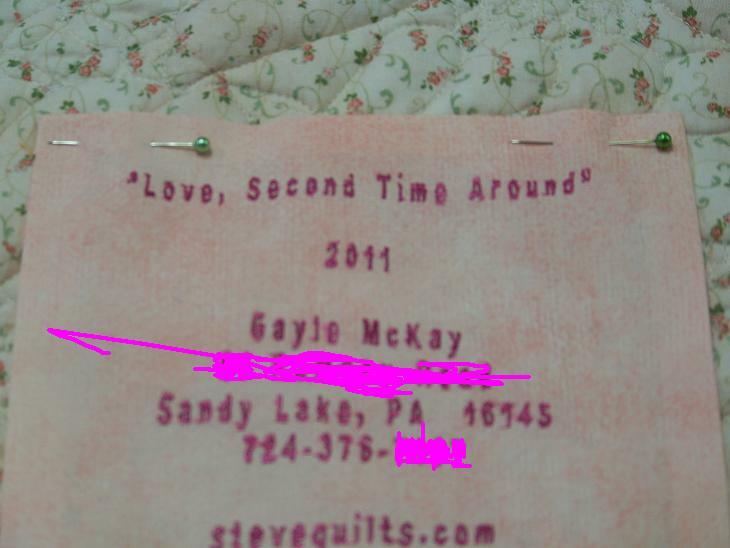 I chose the name “Love, Second Time Around” because the tablecloth was used… re-purposed. And because this project was as wonderful/awful, loving/nasty, good/bad, disappointing/satisfying, and easy/difficult as my 2nd marriage. I was madly in love with my late husband…. and miss him all the time. But living with him was like living on a roller coaster. 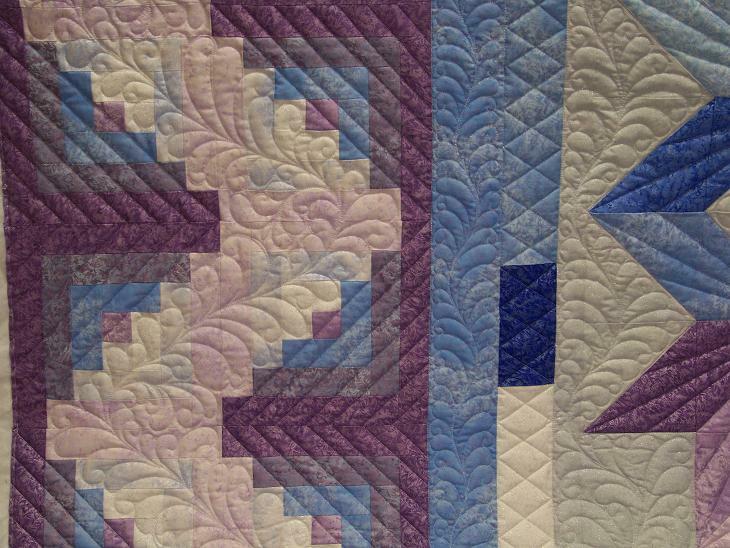 Much like working on this quilt! I thought of him often when stitching it. So the name fit! I got my MQX entry info sent, and some other little jobs done in the last few days. My next little project is to put a border on this round robin I am involved in. The next border has to be appliqued. I have a plan. Plan #537 in fact! 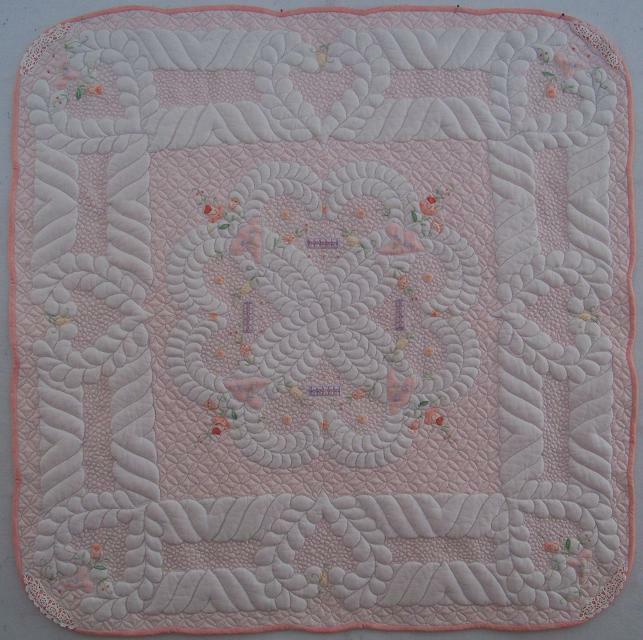 I promised my new blogging friend Carol that I would post my scrappy Grandmother’s Flower Garden quilt. This is just for her. 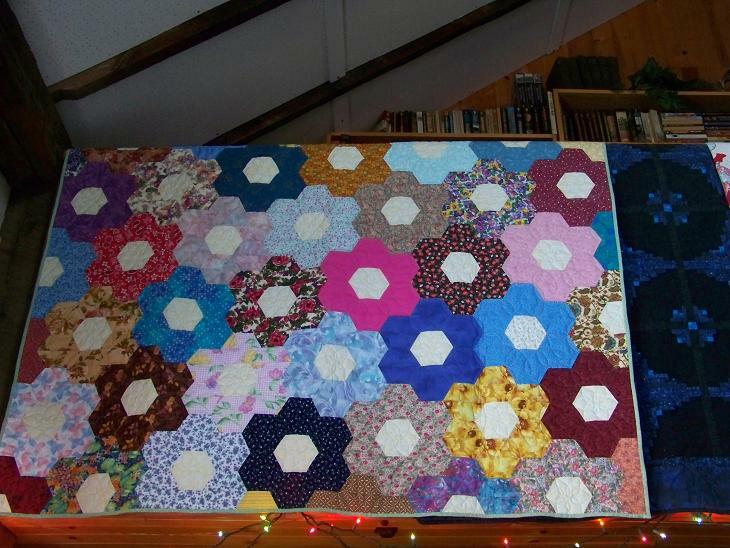 The quilt is hung across our loft rail. 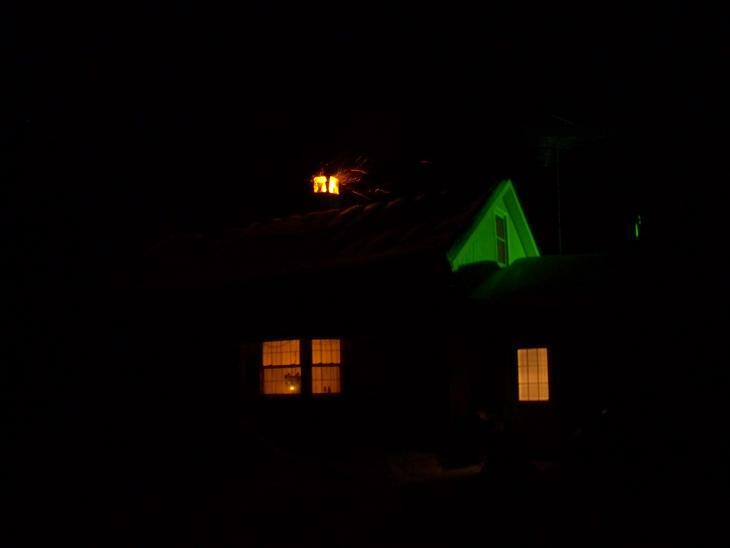 The lights are up all year, but they are on for New Year’s Eve. Happy New Year to new friends and old! PS, make sure you visit Carol’s blog at the link above. 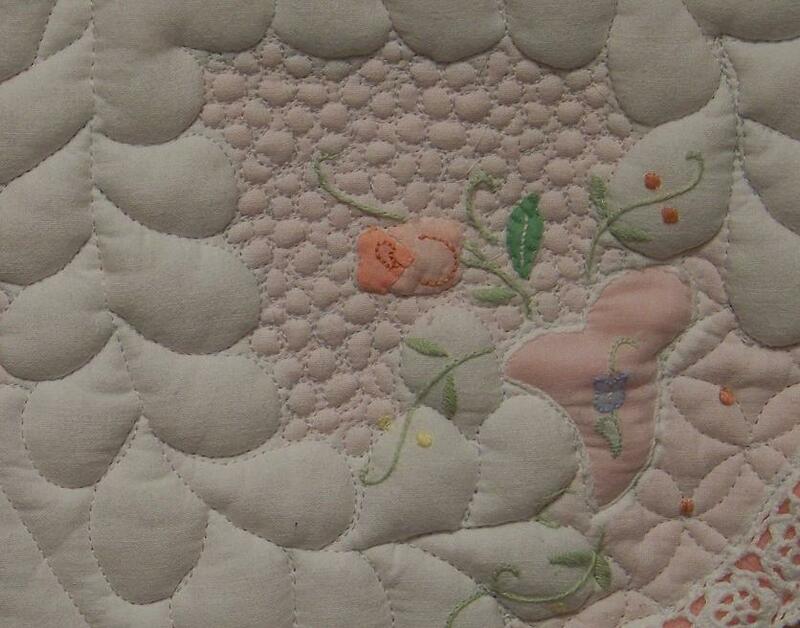 She has some beautiful quilts! 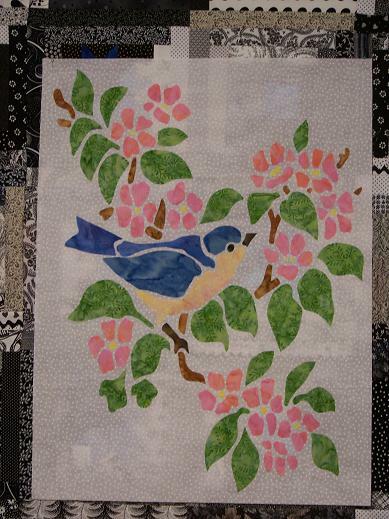 The quilt that I have been working on is called Spanish Rose, by Pear Valley Designs (Ronda Beyer and Jill Kroll). I took a class a few years ago at MQX and started it before I went to the class. 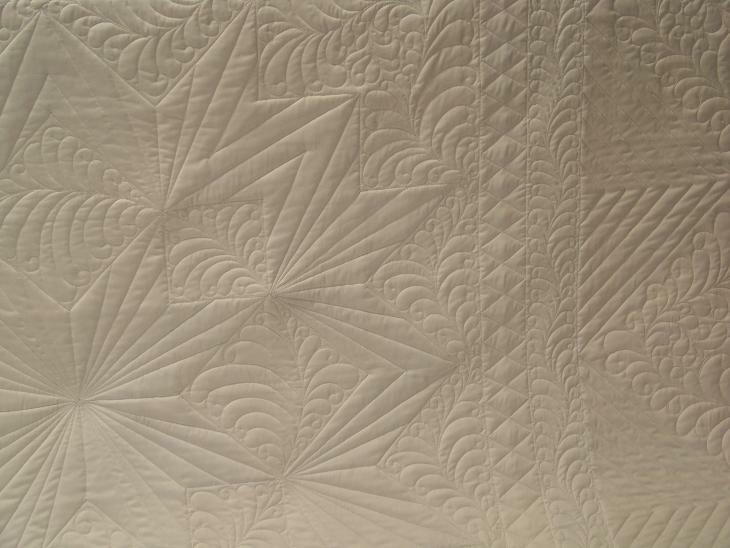 I came home with the feathered star and white background completed. And then it sat on the shelf until last week. Now I am up to the star borders. That border requires LOTS of cutting. 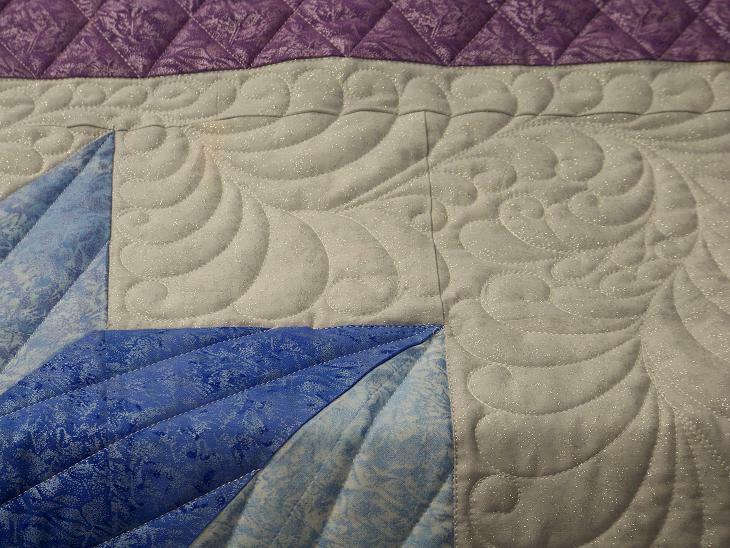 Several others who were in the class have also stalled on their quilt… and are now encouraged to drag it out and get it done. To help those folks (especially Gretchen), this post is an effort to make their cutting experience a little quicker. I read all the directions and figured out which pieces could be cut from 2 sizes of strips. 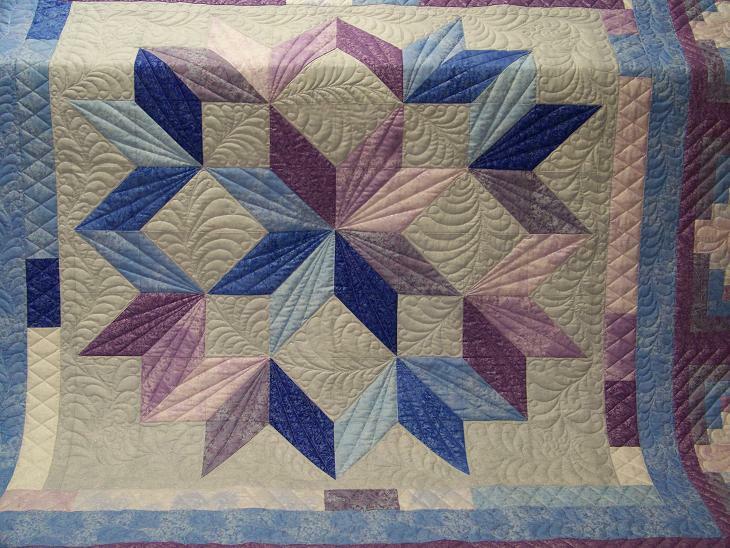 This simplifies the cutting so you can cut ALL the colored star parts at one time, rather than cutting out each individual star. Cut the background fabric as directed. Choose 16 different fabrics. I used fat quarters. Then realized I had lots more fabric than I needed. There are 16 Large stars with a Small star inside. 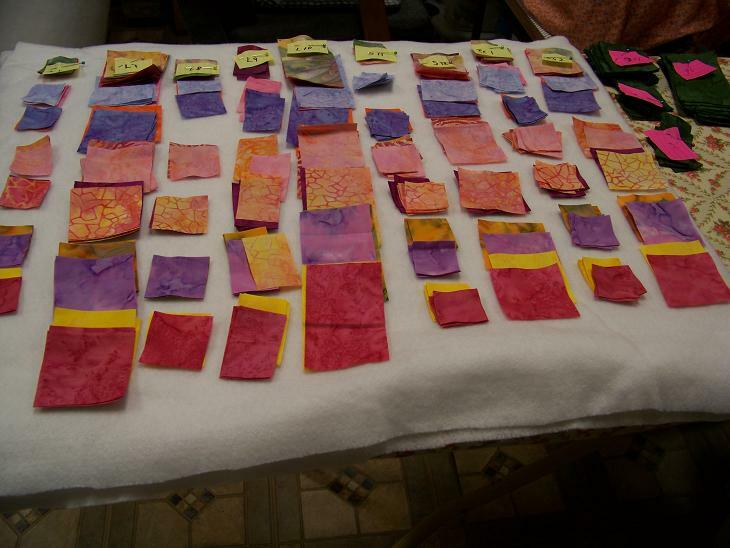 By using 16 fabrics, I get a large and a small of each color. 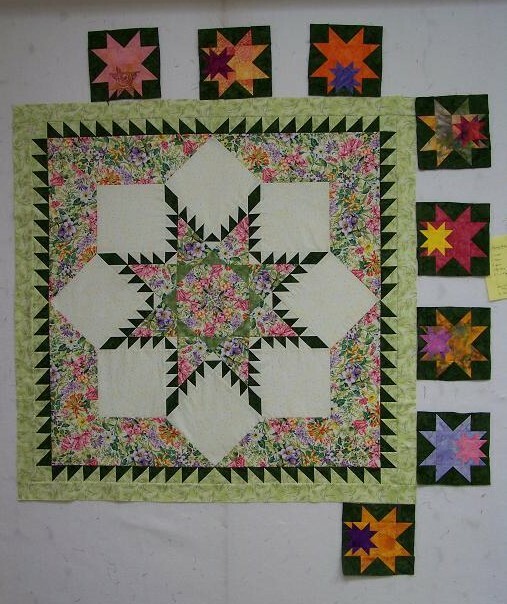 I also used those same 16 fabrics to cut the Small Single stars. I cut 2 of each which is 8 too many. I will be able to play with color placement that way and may use the extras on the back. Or in something else. Whatever. 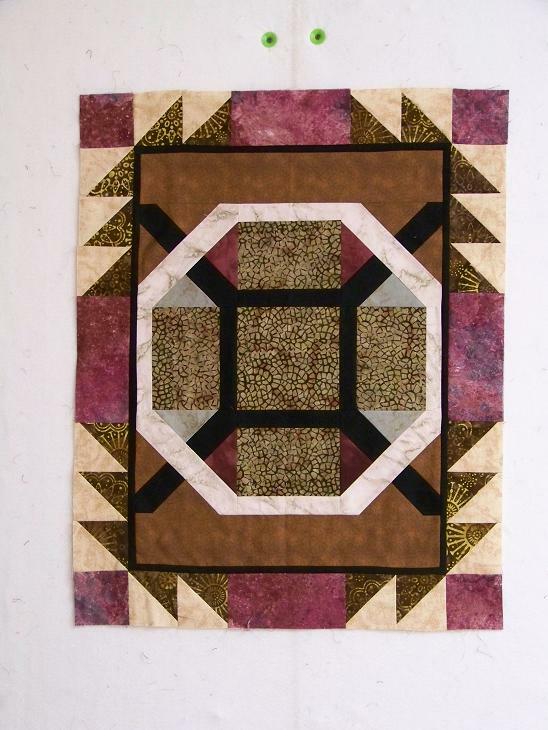 Cut 2 strips from each fat quarter that are 2.5″x18″. Cut 2 strips from each fat quarter that are 1.5″x18″. 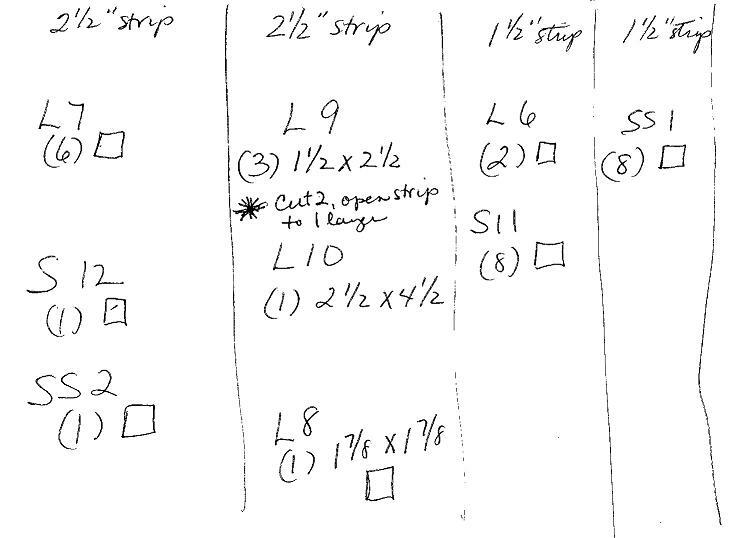 Using the pathetic chart below, subcut your strips into the pieces listed. I hope that helps. If it is as clear as mud, make sure you let me know where I failed. 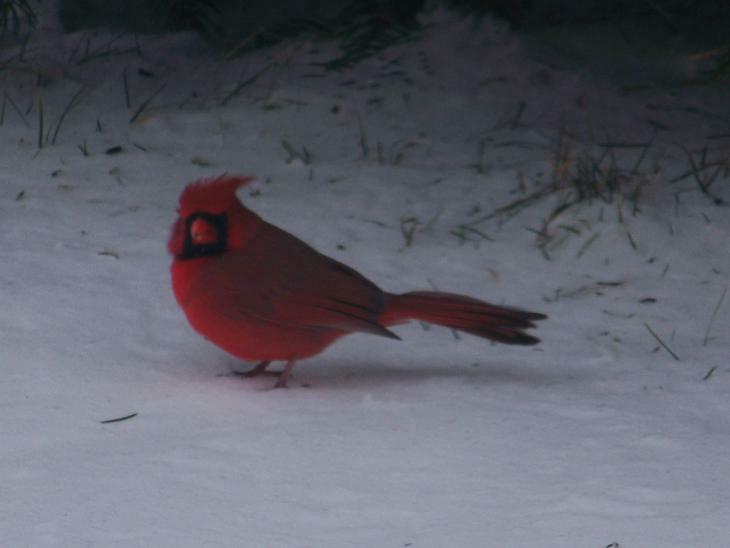 Hey, are you snowed in? To those on the east coast, I feel your pain. We have had 50″ of snow in December, so I really do know how you are feeling. But really… keep it there. We aren’t expecting much snow, but WOW, it is windy out there! I thought the birds were going to blow away! 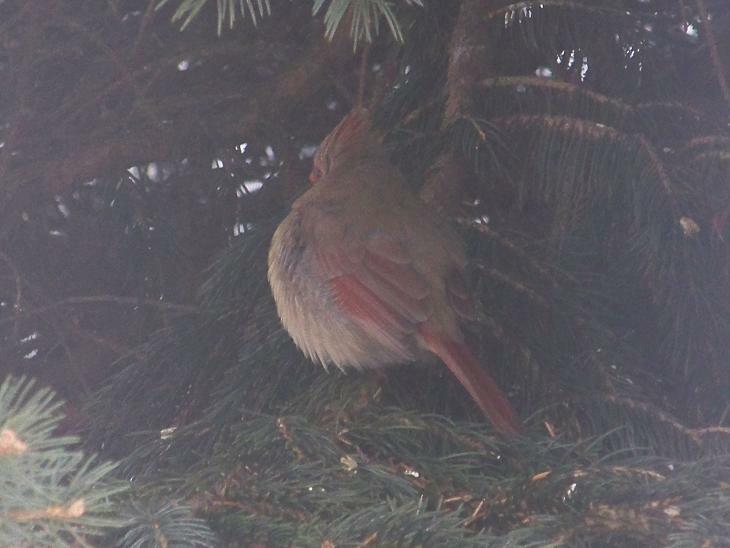 At least his mate had the good sense to take cover and fluff her feathers. Everyone have a good Christmas? Ours was wonderful. Quiet, happy and full of surprises. 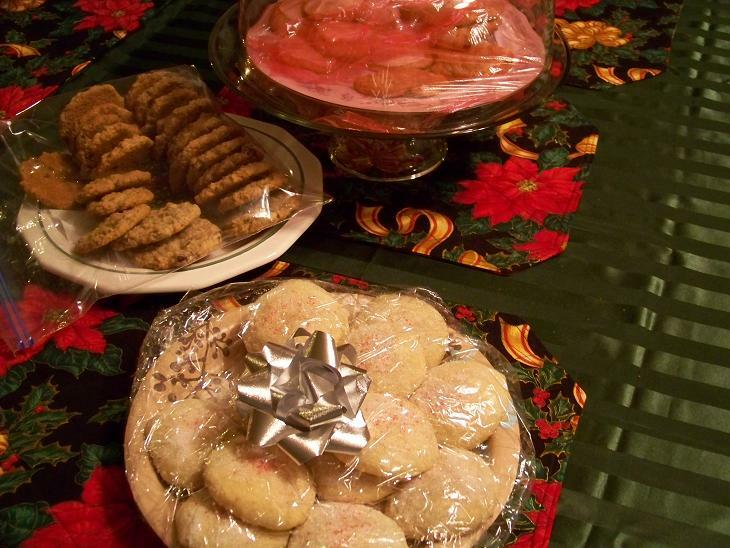 The biggest surprise was when my friend Shirley stopped Christmas night with a plate of her famous home made sugar cookies. Let’s just say that I could NOT get them all the way to the table without swiping one! (I am too ashamed to show you what the plate looks like now.) I hope she shares the recipe with me, so I can use my new mixer. Yesterday I started putting some together. I sewed for 3 hours yesterday, another 8 hours today. And only have 8 blocks to show for it. 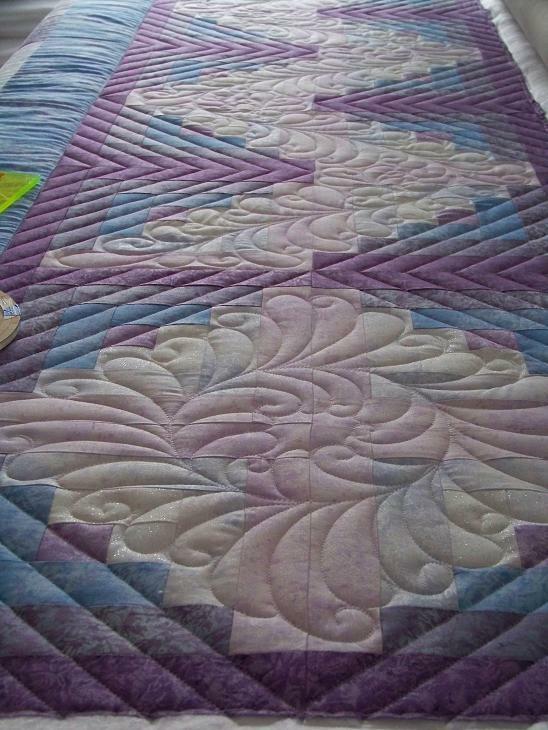 This quilt will take some doing! If I don’t report in for a few days, you will know I am still working on stars! It’s going to be a wild border I think. 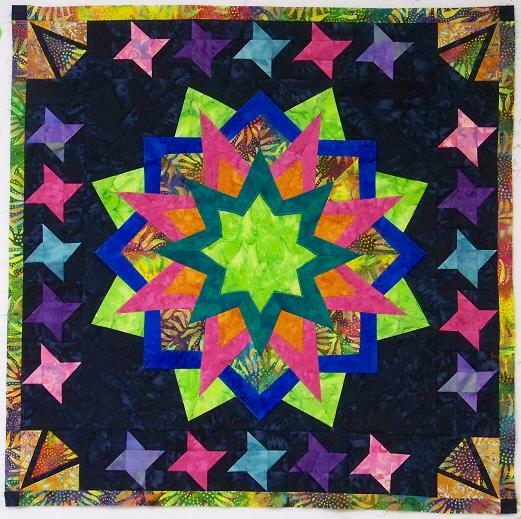 And if anyone else who took this class at MQX with me is looking for the easiest way to cut out the stars, let me know. I got it down to a system! **Remember that you can click on any image to make it bigger. We are very grateful to have our house tonight. We had a chimney fire tonight, and it always give us pause. We have had them before. We burn LOTS of wood. LOTS. We burn those chimney sweep logs too. They help. But when you burn as much wood as we do, and have a 100 yr old house with a very old chimney, the chimney fires are inevitable. We hear the sound of a locomotive…. Steve in living room, me in kitchen. We both yell “CHIMNEY FIRE! !” in unison. Steve closed the fireplace screens, and put a little water on the fire to help it not burn quite so hot. I shut the fire door between south end of old part of house and addition that was old studio (soon to be bedroom… Steve almost took that door off today for part of a remodeling job) Steve shut the fire door between new studio and breezeway, and other fire doors between breezeway and north end of old part of house. I ran to get meds, dropped them in purse, grabbed cell phone and camera, closed another bedroom and bathroom door while Steve ran upstairs to close that bedroom door. We both grabbed coats, slid into boots and ran out back door. Steve also snuck back in quickly to unlock all the doors. I stood outside for an hour and a half. Steve went in twice in the first half hour… till I wouldnt let him anymore. The second time, he opened the door blinds so he could see in to the fireplace from the breezeway. 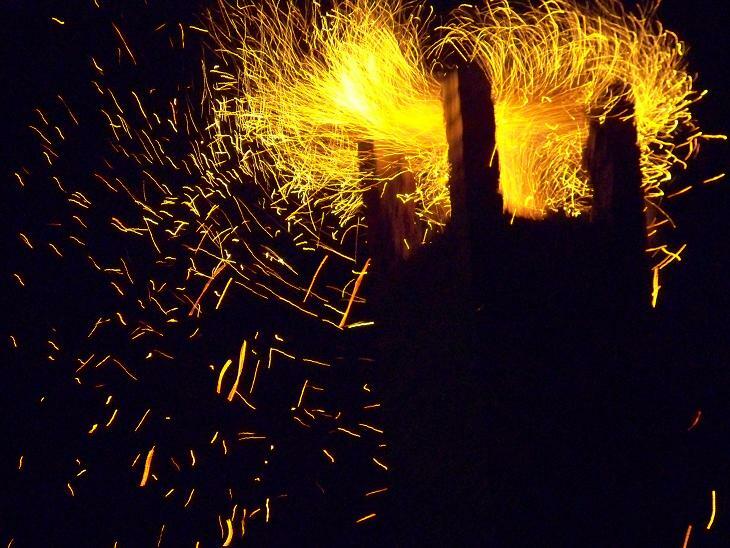 This is the longest a chimney fire has ever taken to burn itself out. Luckily it was 25 degrees instead of 20 below. During the time it was burning, a neighbor drove up the driveway and asked me….. as I stood in the dark in hat, coat, boots, gloves, and PAJAMAS…. 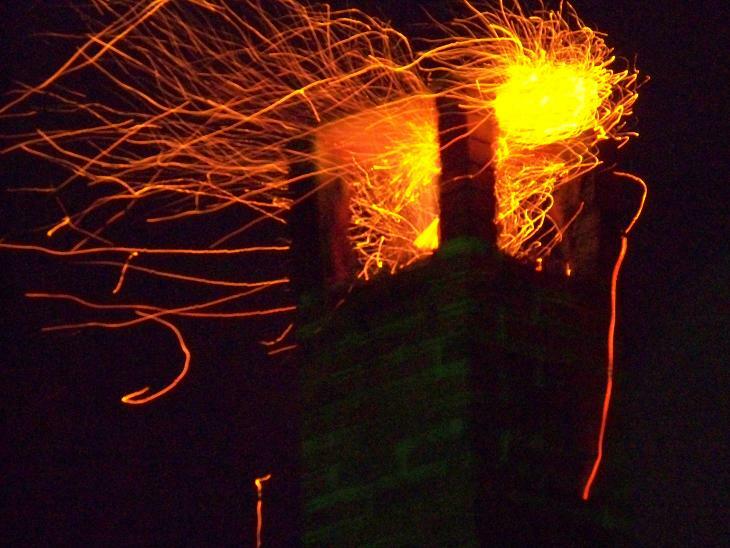 if I knew my chimney was on fire. I sure do, but I am SO glad you stopped to tell us. If we hadn’t been home, or hadn’t come to the door, I hope you would have called 911. He would have, for sure. Living in a rural area has the benefit of neighbors taking care of each other! So….. 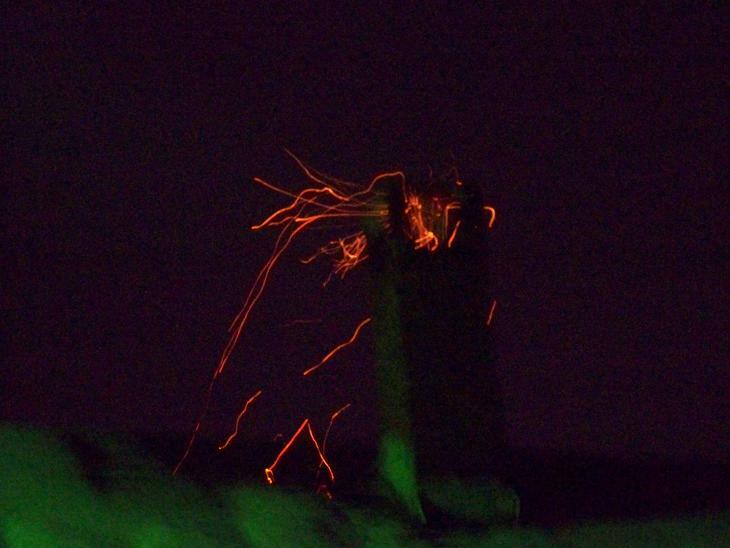 I hear you wondering what a chimney fire looks like. 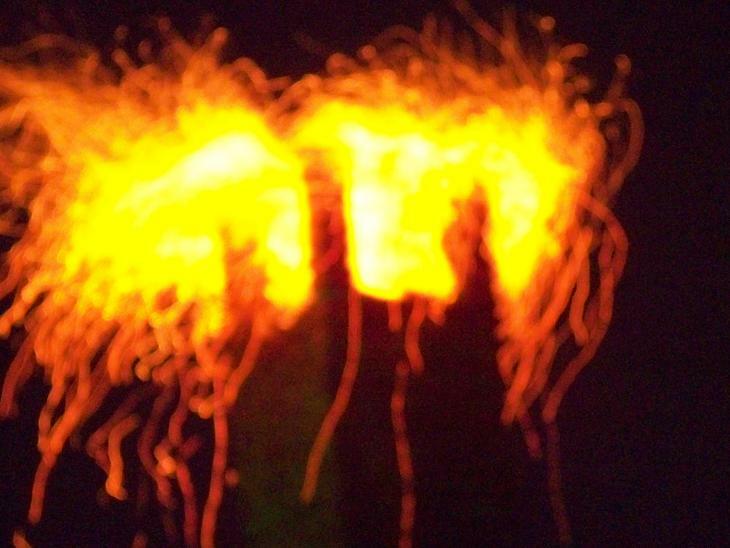 The fire burns from the top, down and often waxes and wanes…. 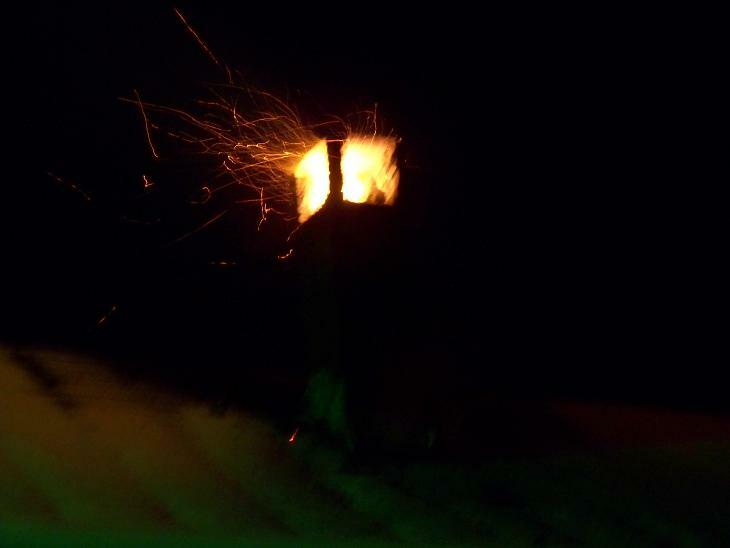 Of course, all we can see is the top of the chimney, outside. 1. breathe the air outside so my asthma doesn’t kick in from the smoke. 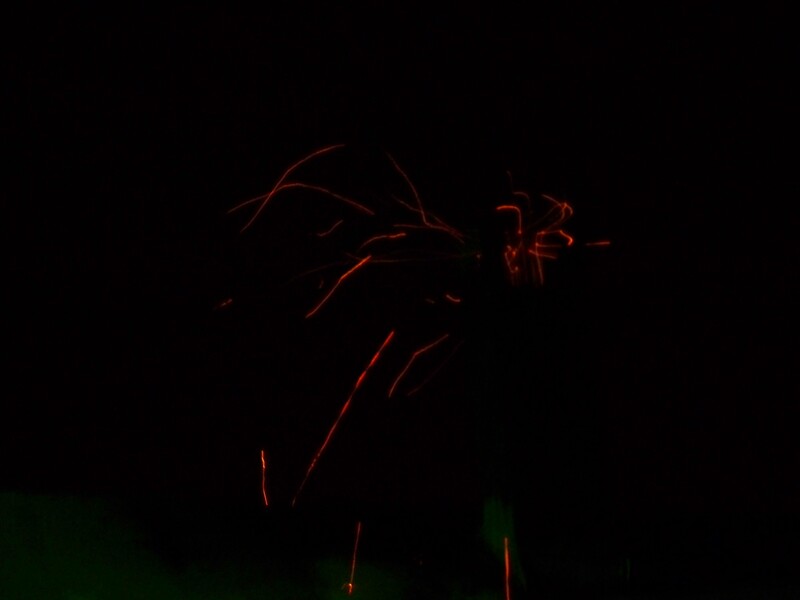 2. watch to make sure no big blobs of fire catch the roof on fire. (which means call 911 if the roof catches fire) Other years, Steve has had to take water buckets to the roof, up a ladder. Thankfully, not tonight. These big balls of fire scare the crap outa me. I watched it roll down the roof through 4 inches of snow. Kind of like a fire snowball that put itself out in the snow. And these last two are what it looks like when we know it is just about out. So the doors and windows in the old part of the house and the old studio are all open, still airing out. (The double set of fire doors between old part of house and new studio keep ALL smoke out of there.) I will be doing laundry for DAYS. 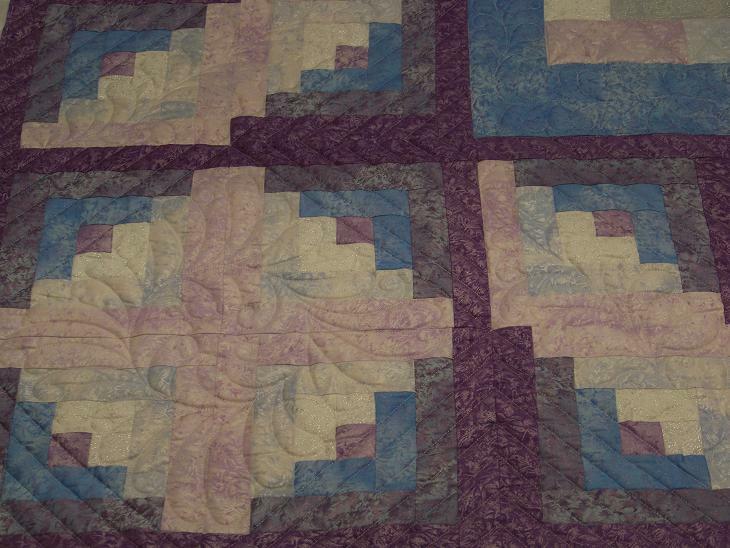 Eight quilts in the living room reek of wood smoke, I am sure. Two big laundry baskets of what WERE clean clothes will need to be washed again. And towels and linens… and coats and jackets that hang on hooks by the back door. But I am not complaining. I am SO GRATEFUL that we have each other, have heat, and a HOME. Food to cook, a sound roof that didn’t catch fire, a tame fire burning in the fireplace again, and good neighbors to check on us. Really, who could ask for more? Laundry is a snap. We are blessed.